ISTC Training Modules 2008 Healthcare provider-related factors: Inadequate initial treatment regimen: Wrong combination or doses, guideline noncompliance Treatment “in the dark” for retreatment cases: no drug susceptibility testing available, or results delayed Clinical errors: Adding a single drug to a failing regimen Lack of proper monitoring Lack of proper provider awareness Healthcare provider-related factors may include: Inadequate regimen - this could happen if an inadequate regimen is prescribed (wrong combination or doses). 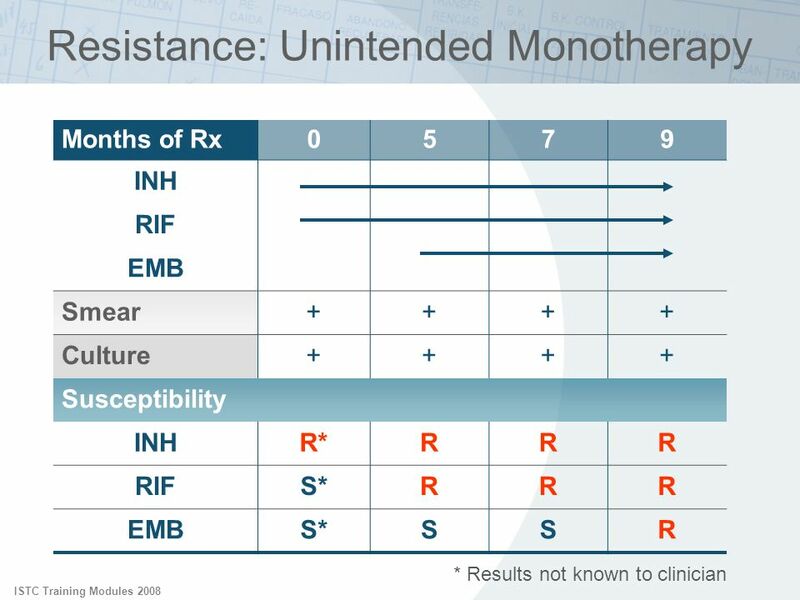 The provider may not be aware of a drug-resistance pattern particularly if drug-susceptibility testing is not available or results are pending. 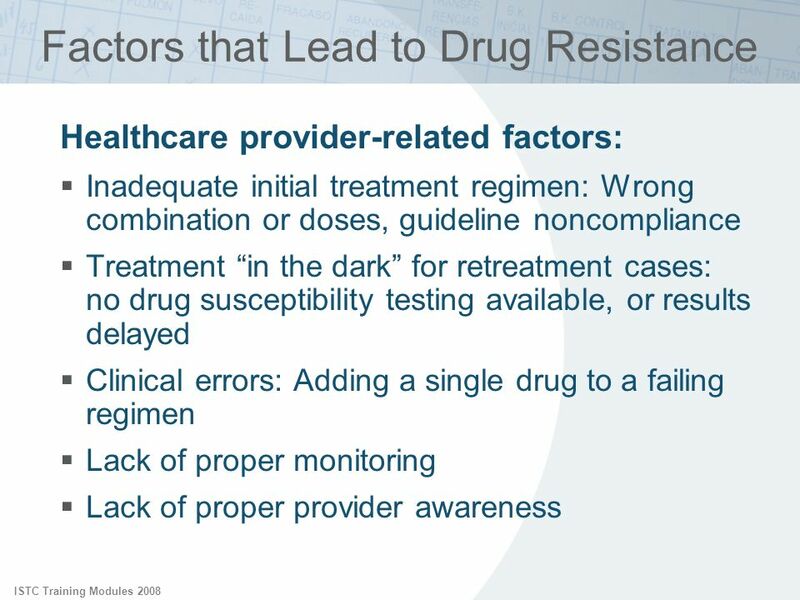 Understanding and recognizing the risk factors that should raise suspicion for drug resistance is critical. Well-crafted local or national guidelines should be followed to optimize results. 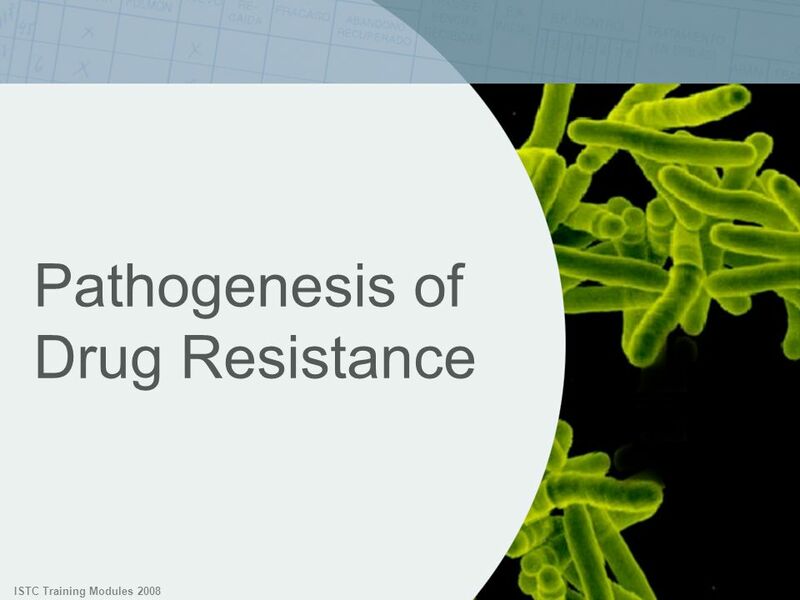 Poor case management and physician errors such as adding a single drug to a failing regimen may select for drug-resistant mutants. 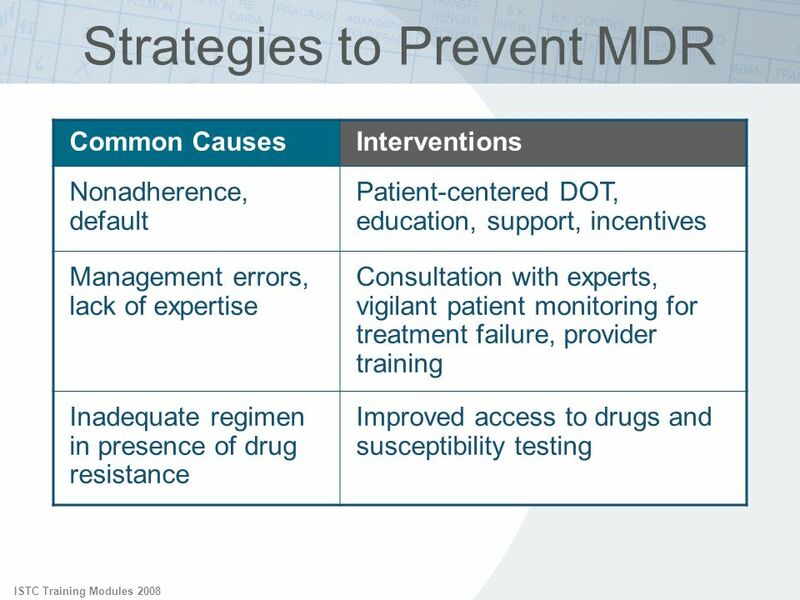 Lack of proper monitoring can delay appropriate interventions, allowing complications to go undetected and progress. 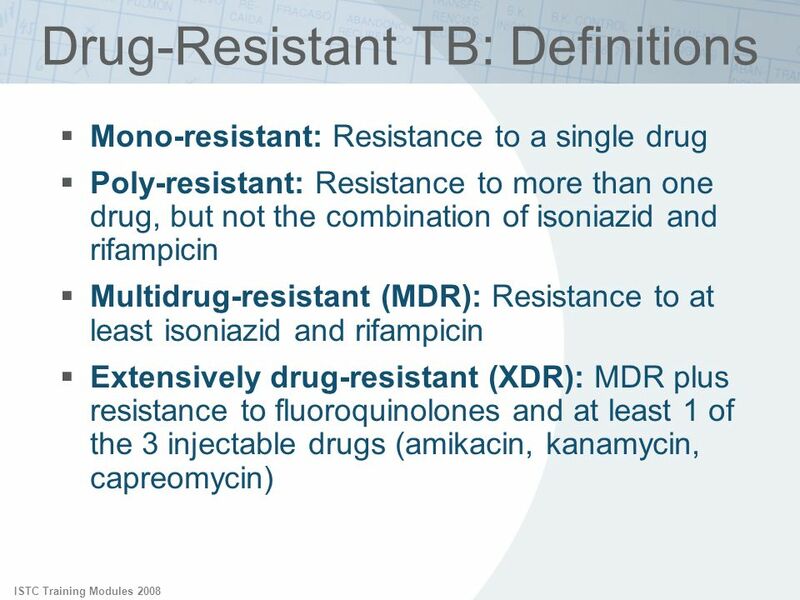 A lack of knowledge regarding the complexities of TB treatment can lead to mismanagement and the development of drug resistance. ISTC Training Modules 2008 Healthcare program-related factors: Inconsistent access to care Unavailability of drugs (stock-outs or delivery disruptions) Poor drug quality, poor storage conditions Poorly organized or under-funded TB-control programs Inappropriate or no guidelines Lack of appropriate or timely laboratory testing Some healthcare system-related factors that can contribute to suboptimal treatment and development of drug resistance: Poor access to care may be a significant factor. Centralized care may not reach isolated regions of catchment area. 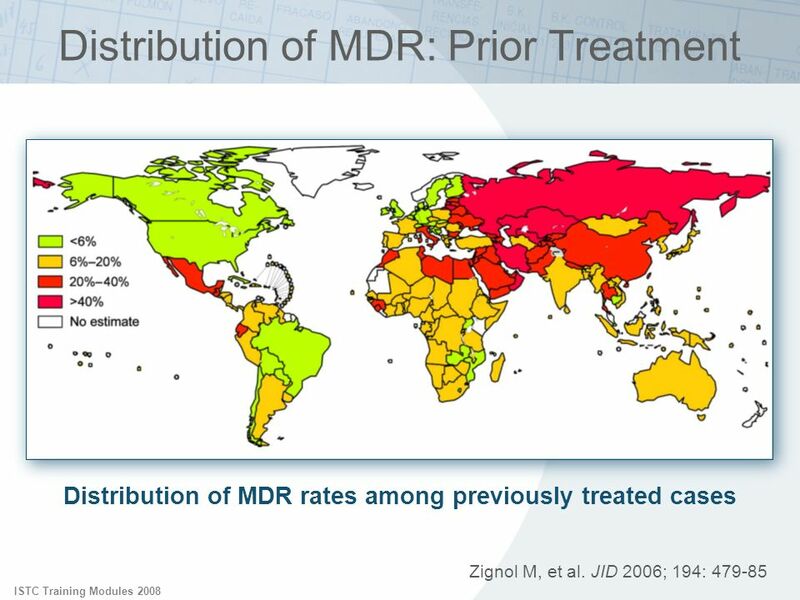 Consistent drug availability and quality is a problematic issue for many areas of the world. 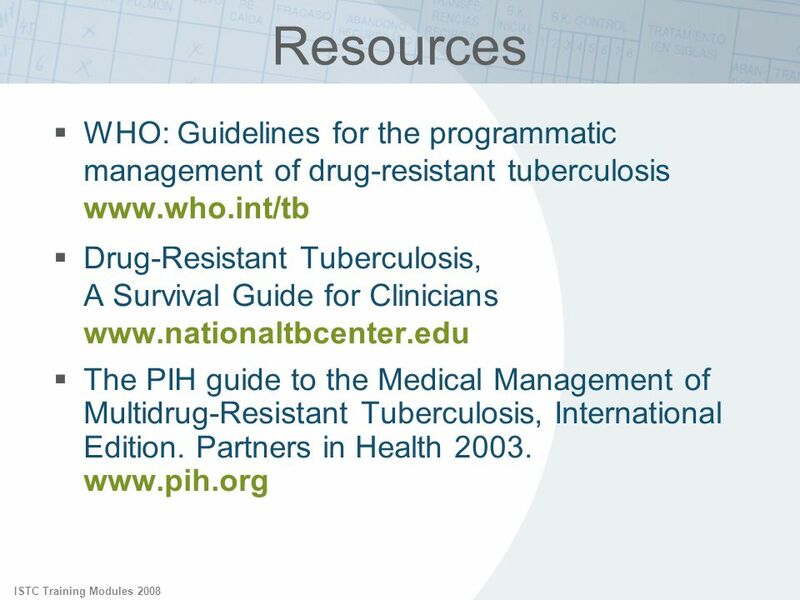 Not all areas have a strong or adequately funded TB-control program to offer public health oversight, nor are up to date guidelines available for all localities. 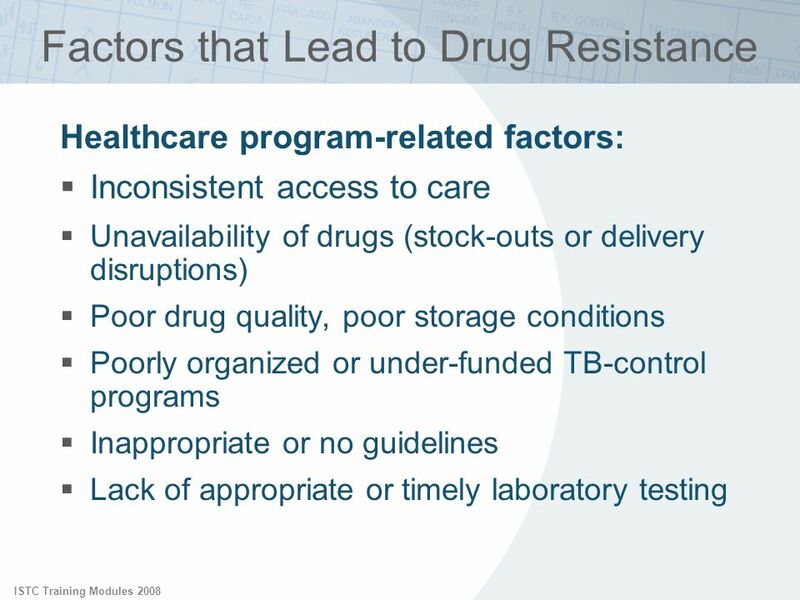 Due to resource limitations, optimal high-quality laboratory testing with timely results is not available in all areas. 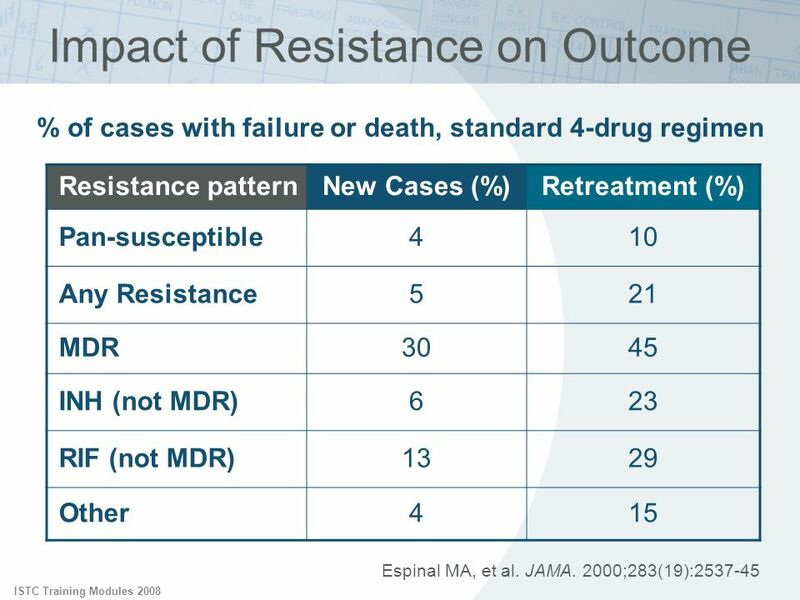 Lack of optimal testing does not directly cause the development of drug resistance, but can constrain the ability to appropriately recognize and treat complex drug-resistant cases. 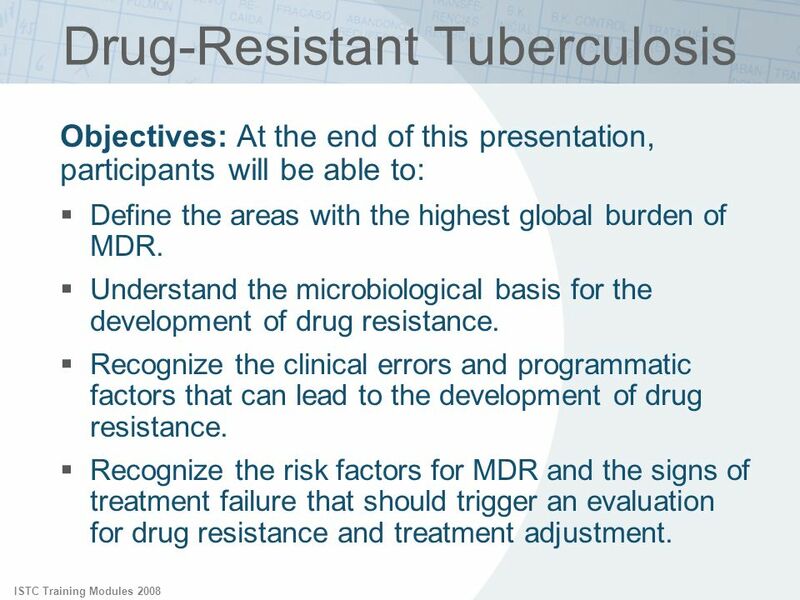 ISTC Training Modules 2008 Appropriate diagnosis and timely treatment intervention for MDR-TB is facilitated by: Recognition of risk factors for MDR-TB Early recognition of treatment failure Drug-susceptibility testing (if available) To identify patients with potential drug resistance and begin appropriate treatment in a timely manner, clinicians should focus on: Recognizing and evaluating risk factors for MDR-TB Recognizing and properly monitoring for evidence of treatment failure Developing the appropriate clinical suspicion for drug-resistance is the essential first step. Treatment can then be adjusted based on local guidelines, and case management and monitoring also adjusted accordingly. 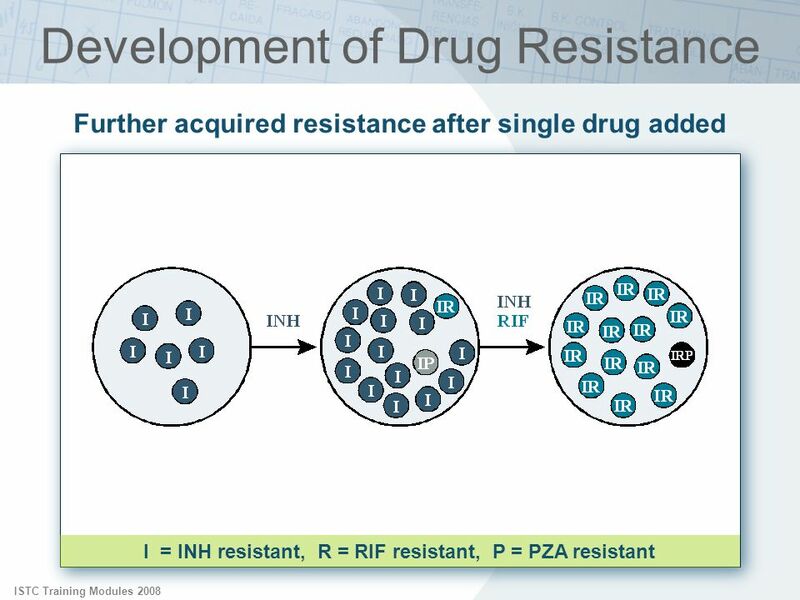 If laboratory resources are available, timely use of drug-susceptibility testing can confirm the presence of drug resistance and allow the informed tailoring of treatment drugs. 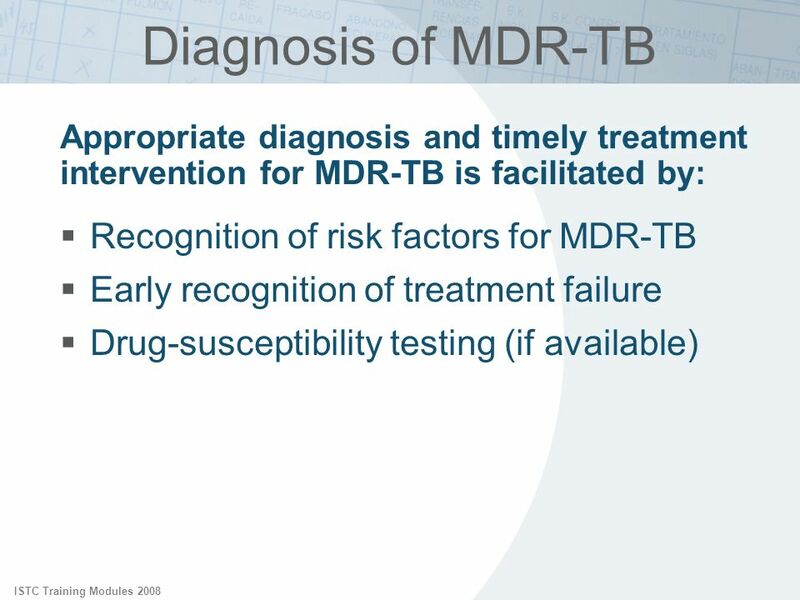 If MDR-TB is strongly suspected, consultation with an expert is suggested. ISTC Training Modules 2008 Recognition of risk factors: History of prior therapy (most powerful predictor) History of non-adherence, default Residence in an MDR-endemic area Exposure to known or suspected MDR-TB case (“incurable” TB or TB requiring multiple treatment courses) HIV infection (in some settings) Clinical and epidemiologic risk factors for MDR, as noted in Standard 14, that should be assessed include: History of prior treatment - the most powerful predictor for MDR: A history of prior treatment may be difficult to obtain. 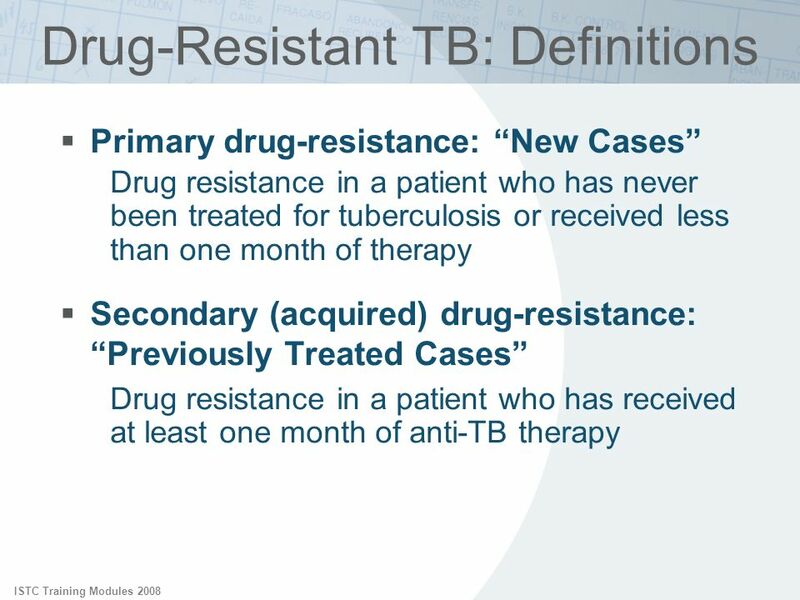 Patients may not know that they were treated for TB or may willfully deny prior therapy. 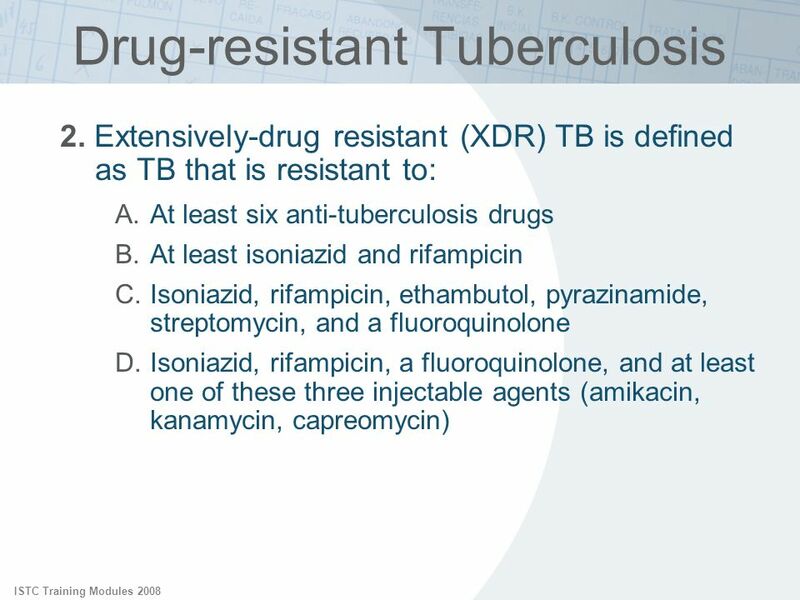 In the patient who cannot describe what he/she was treated for, clues can be obtained by asking the duration of treatment (few lung diseases other than TB will be treated for 6 or more months with antibiotics), the number and color of pills or use of injections (possible streptomycin), or orange-discoloration of urine (rifampicin). 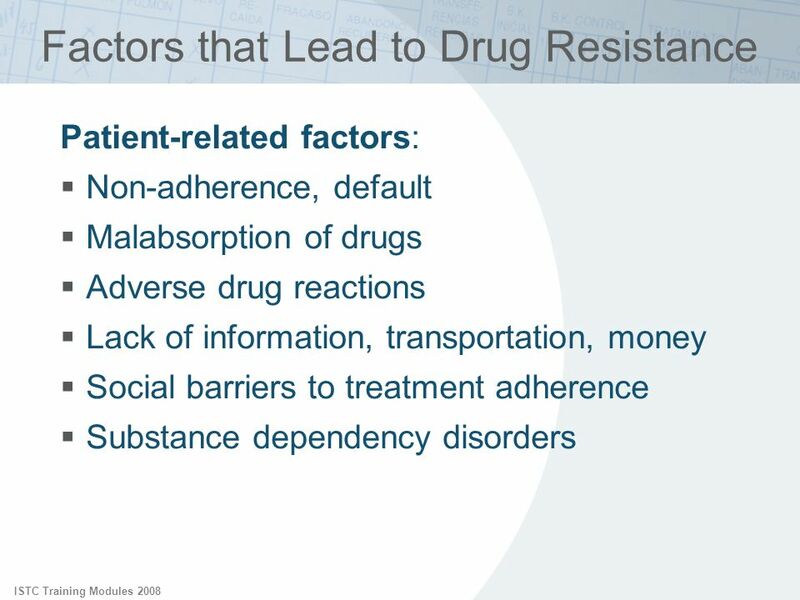 It is important to attempt to determine if the patient was adherent to treatment by asking directly and indirectly. If there has been prior treatment, the source of the treatment should be ascertained. 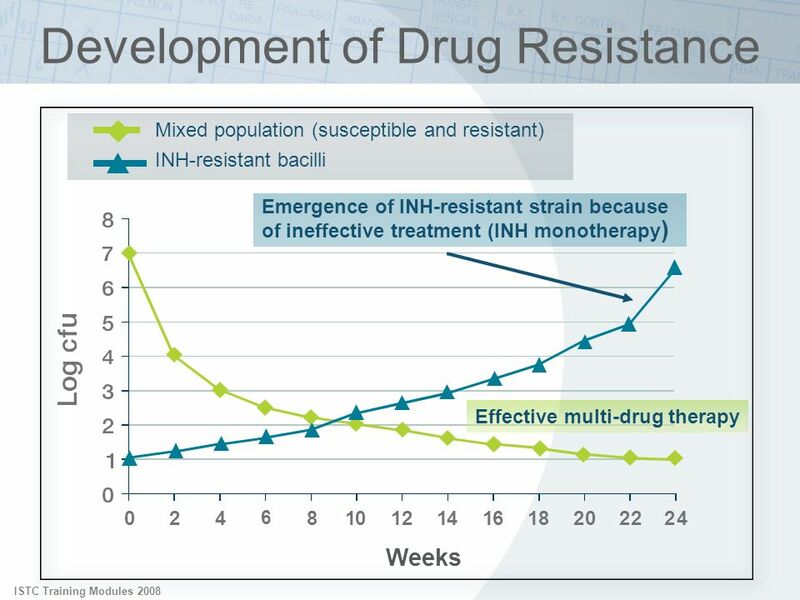 Community prevalence of drug resistance: In most situations this is not known. 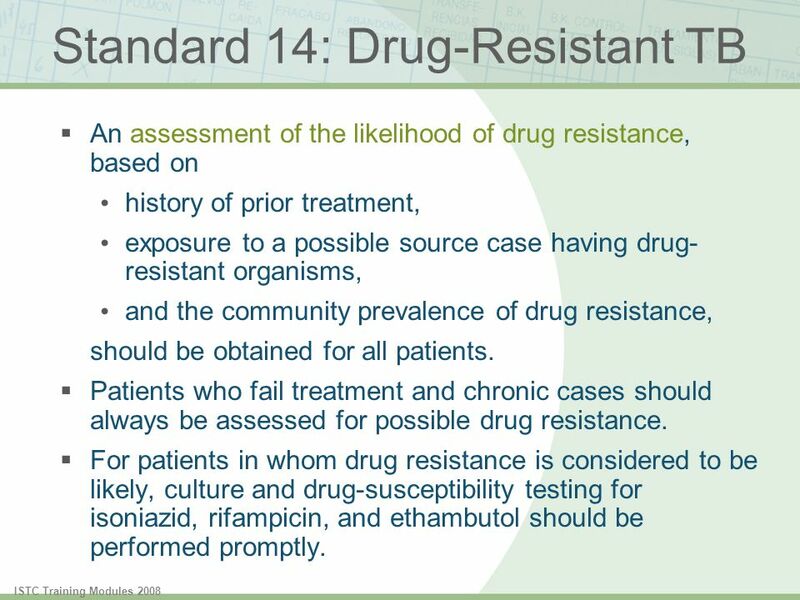 In general one should not assume that a previously untreated patient has drug-resistance based on an assumed prevalence of drug resistance. 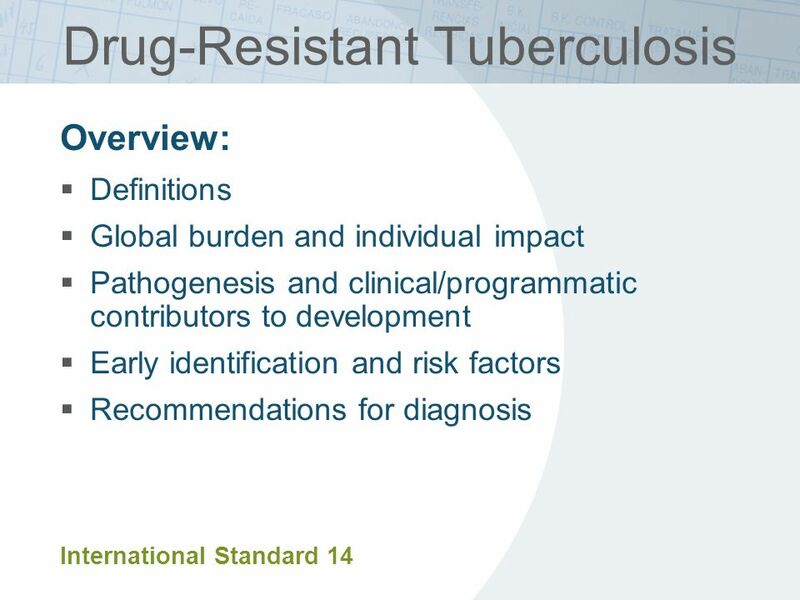 Exceptions would include certain specific situations in which a high prevalence of drug resistance has been documented such as some refugee-camp settings or documented outbreaks. 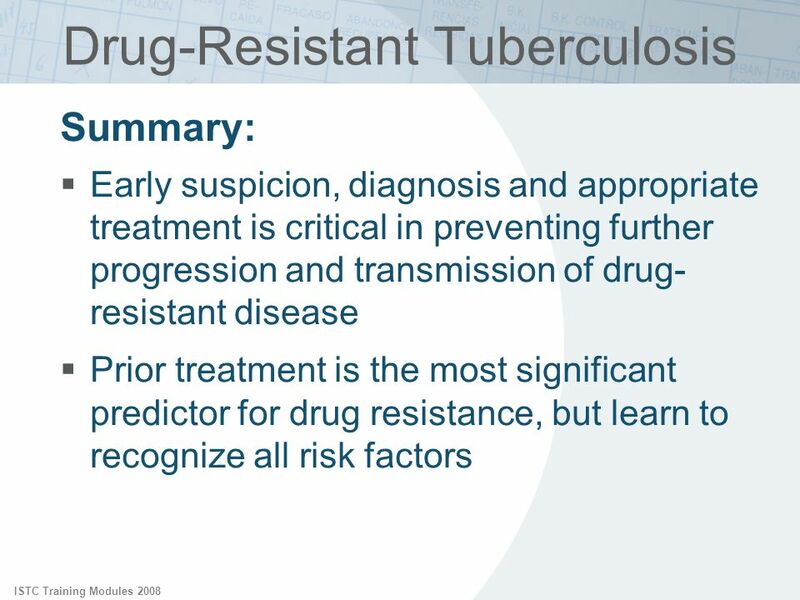 Exposure to possible drug-resistant sources: Commonly, patients do not know if there has been exposure to a drug-resistant source case. 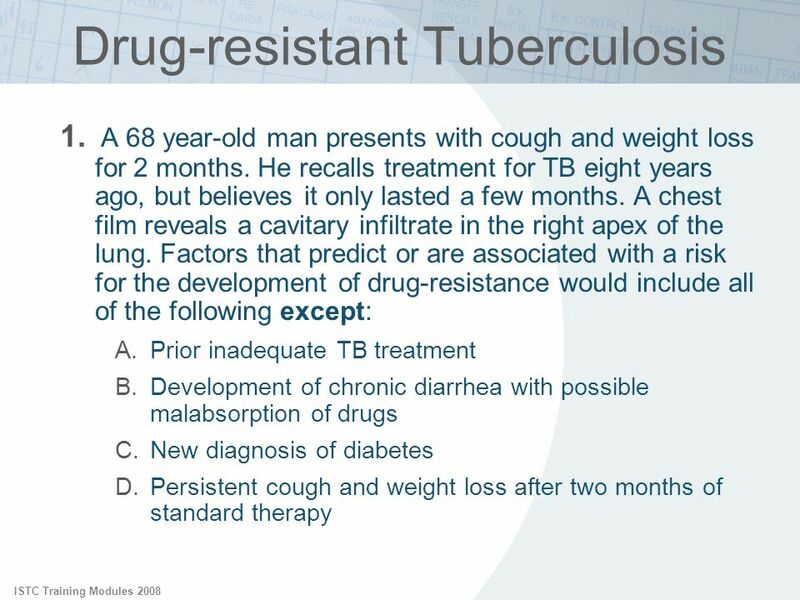 The provider should ask if anyone in the house has had tuberculosis or any lung disease for which they have been treated for many months repeatedly, or if their treatment for TB was deemed “incurable”. 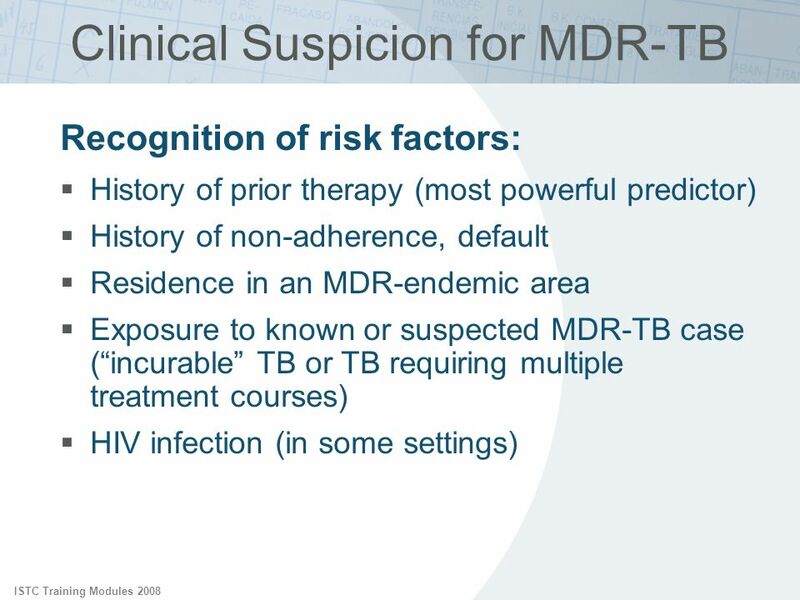 HIV infection: In some areas of the world, HIV infection is a risk factor for MDR. 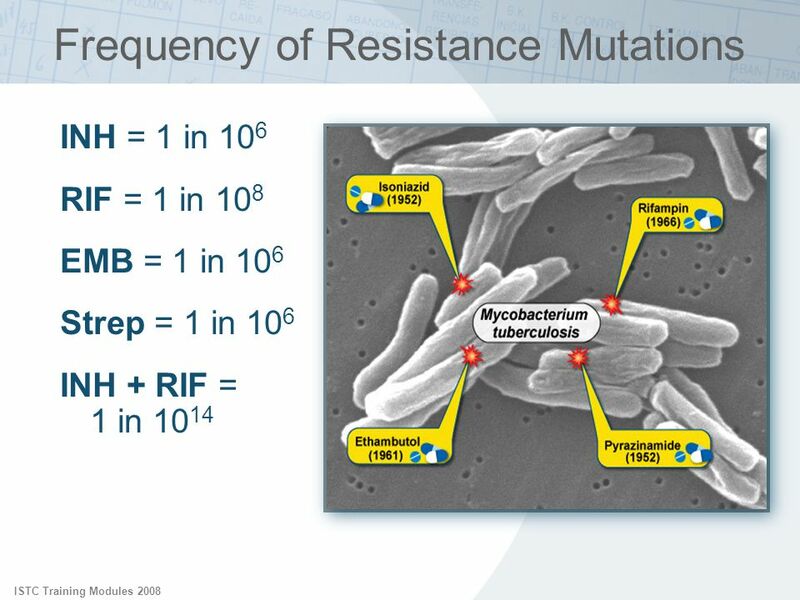 HIV is also associated with acquiring rifamycin resistance. 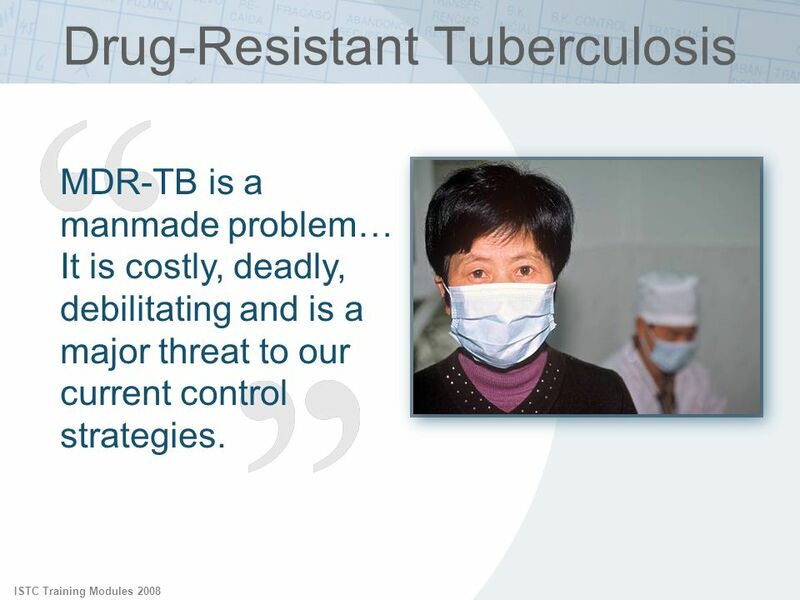 Hence, HIV-infected TB patients deserve special attention. Assessment of the response to treatment in patients with HIV infection is often complicated by the likelihood of other opportunistic lung diseases. 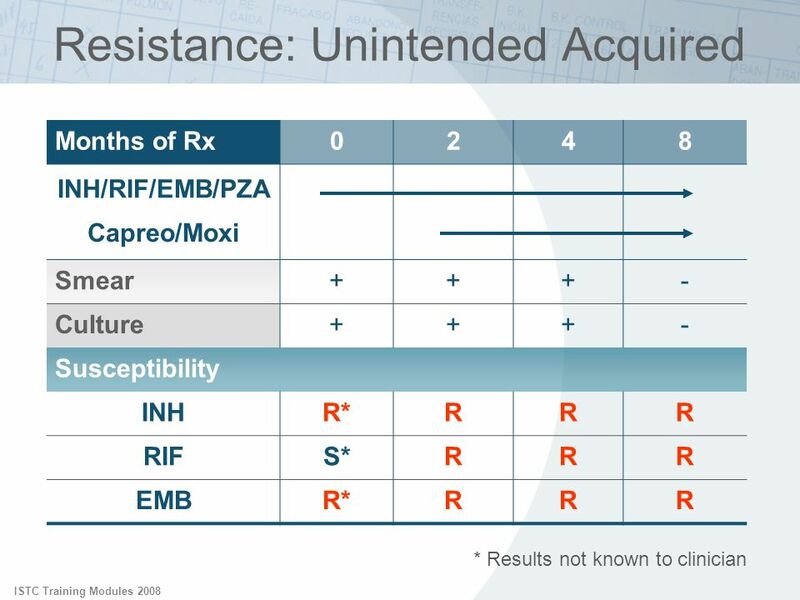 Adherence should be assured and intermittent treatment regimens should be avoided if CD-4 counts are low. ISTC Training Modules 2008 Early recognition of treatment failure: Cough should improve within the first two weeks of effective treatment Signs of failure: lack of sputum conversion, persistent or recurrent cough, continued fever, night sweats and failure to gain weight Early recognition of signs and symptoms for treatment failure in patients currently on TB treatment should also raise clinical suspicion for possible drug-resistant disease. Clinical evidence of failure can include persistence or recurrence of symptoms. A significant proportion of patients with cough improve over the initial few weeks of treatment. 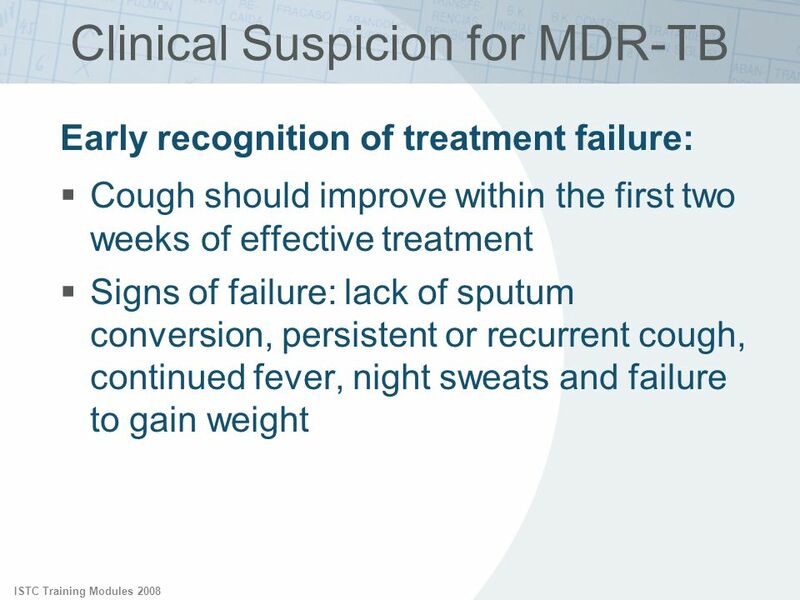 An unchanged or worsening cough may be an early clue for treatment failure. Suspicion of treatment failure should prompt further microbiologic evaluation. The official WHO definition for treatment failure is a positive sputum smear at month 5 of treatment. A high percentage of patients usually become smear negative by month 3 and some experts would consider a thorough reevaluation of the patient at this time point. 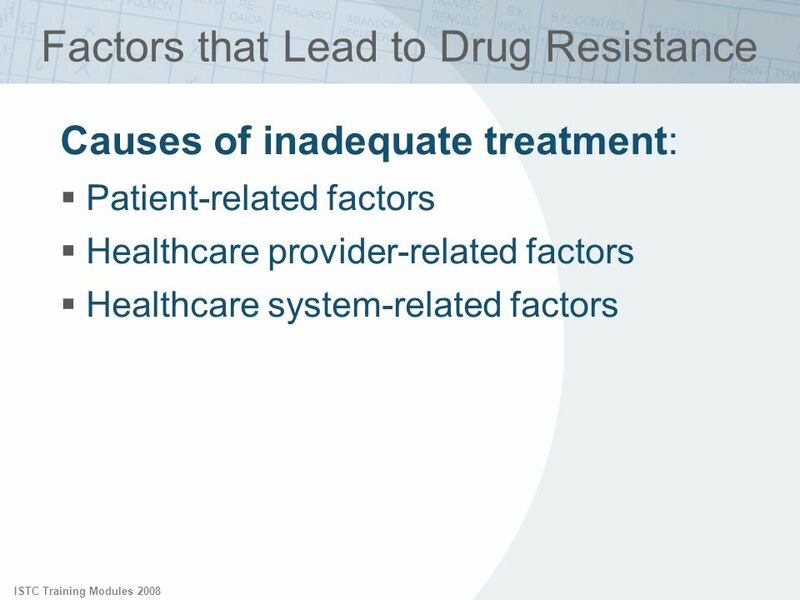 If treatment failure is suspected, the patient should also be assessed for other factors that may contribute to inadequate treatment (non-adherence, malabsorption, etc) and DOT instituted if not already in use. 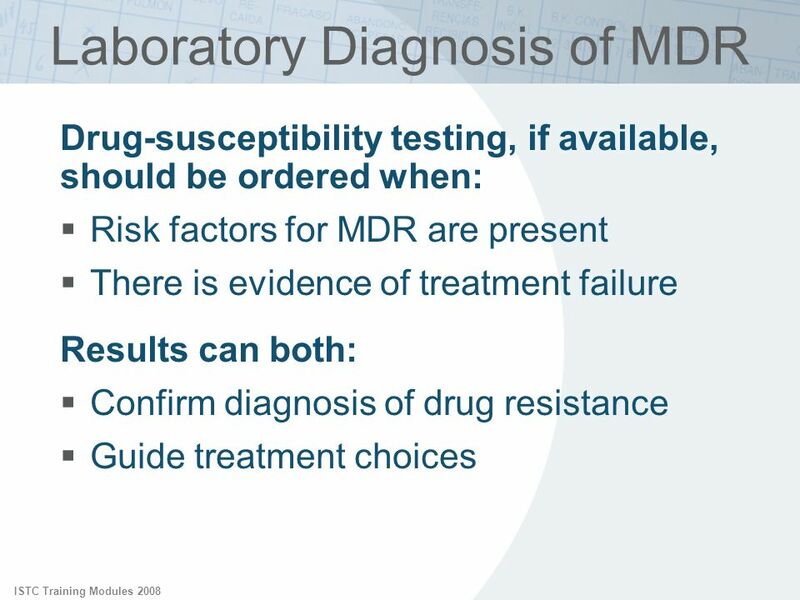 ISTC Training Modules 2008 Drug-susceptibility testing, if available, should be ordered when: Risk factors for MDR are present There is evidence of treatment failure Results can both: Confirm diagnosis of drug resistance Guide treatment choices If drug resistance is suspected based on the assessment of clinical or epidemiologic risk factors and/or evidence of treatment failure, whenever possible, drug-susceptibility testing (DST) should be obtained to both confirm the diagnosis and pattern of drug resistance and guide treatment choices. 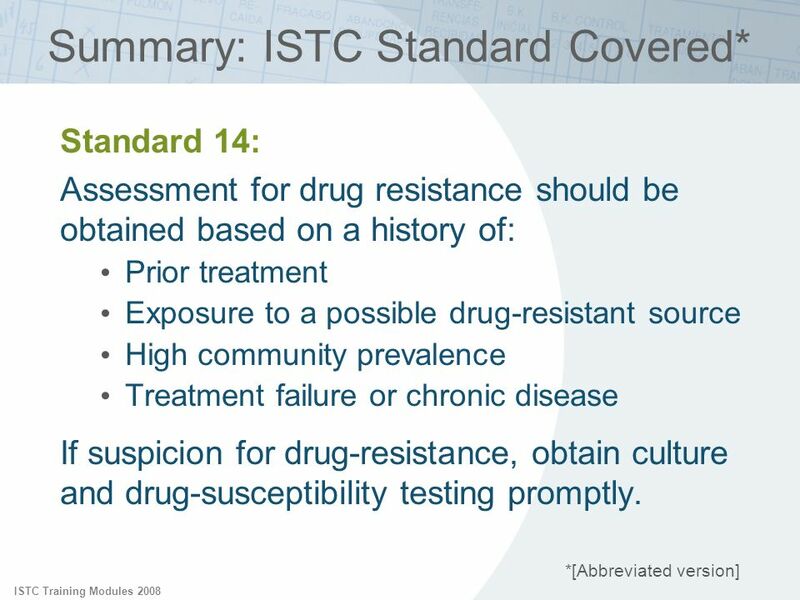 ISTC Training Modules 2008 Identification of MDR may take 4 – 8 weeks, and second-line drug testing 6 – 12 weeks for results: 2 – 4 weeks for initial culture to become positive Additional 2 – 4 weeks to get 1st-line DST Additional 2 – 4 weeks to get 2nd-line DST  In view of this inherent delay, don’t wait to treat with an augmented regimen if MDR suspicion is high and resistance pattern can be predicted. One must realize that current available DST methods are slow. With standard culture and DST methods, 4-12 weeks are usually needed to get results (liquid broth methods are faster) from the time of initial sputum collection to the completion of both first- and second-line DST tests. 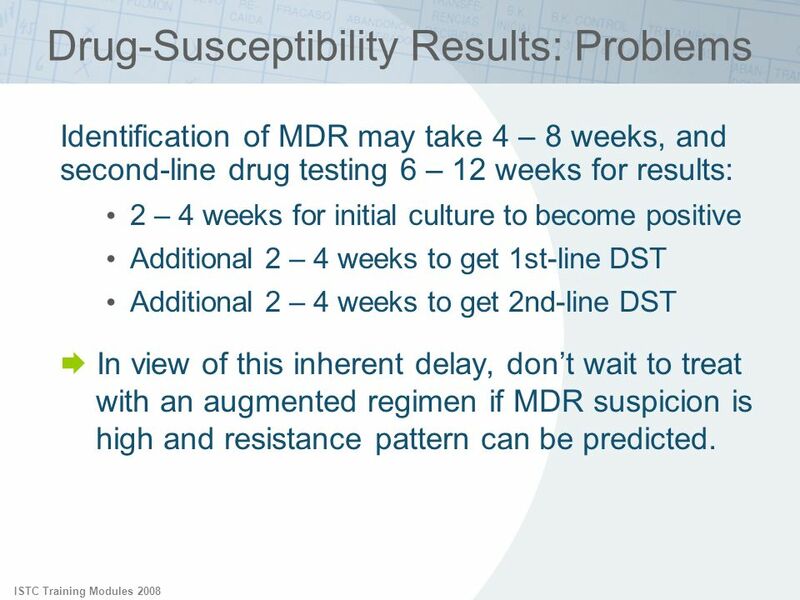 Because results take a long time to return, one should NOT wait to treat a patient who is suspected of having MDR with an augmented regimen that includes a fluoroquinolone and injectable agent. 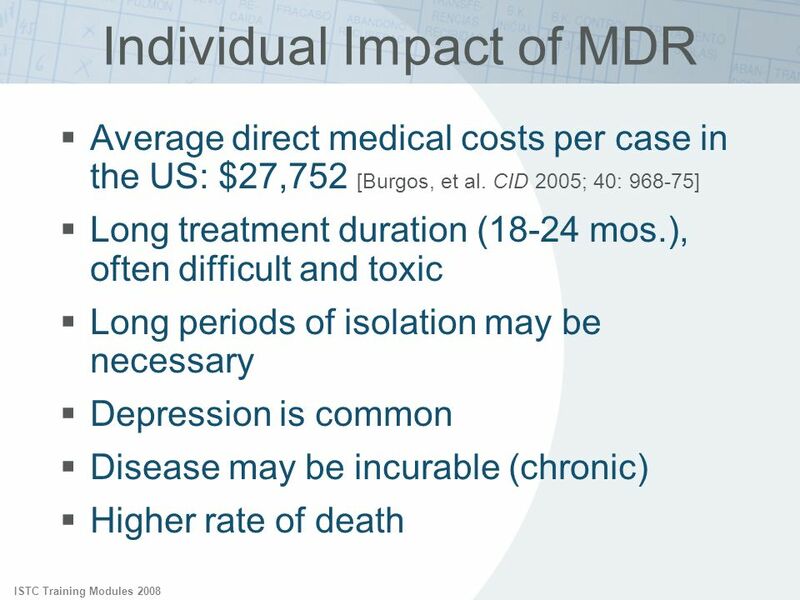 The only reason not to treat an MDR suspect while waiting for test results is when the disease burden is minimal or if prior MDR treatment was given and it remains unpredictable which drugs will work. ISTC Training Modules 2008 Drug-susceptibility testing requires training and experience Quality assurance is difficult Testing is unreliable for some drugs, especially ethambutol and pyrazinamide Results will sometimes differ in different laboratories In addition to the current methods being slow, there are other common problems with drug susceptibility testing. 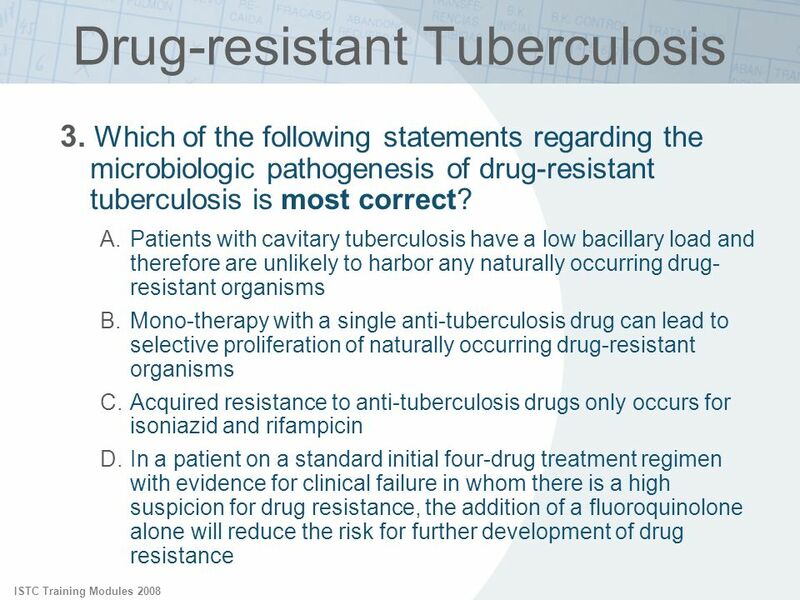 Substantially more training and experience is required for susceptibility testing than for culture alone. Having a quality assurance program in place is essential, yet few labs are qualified to provide the assessments. 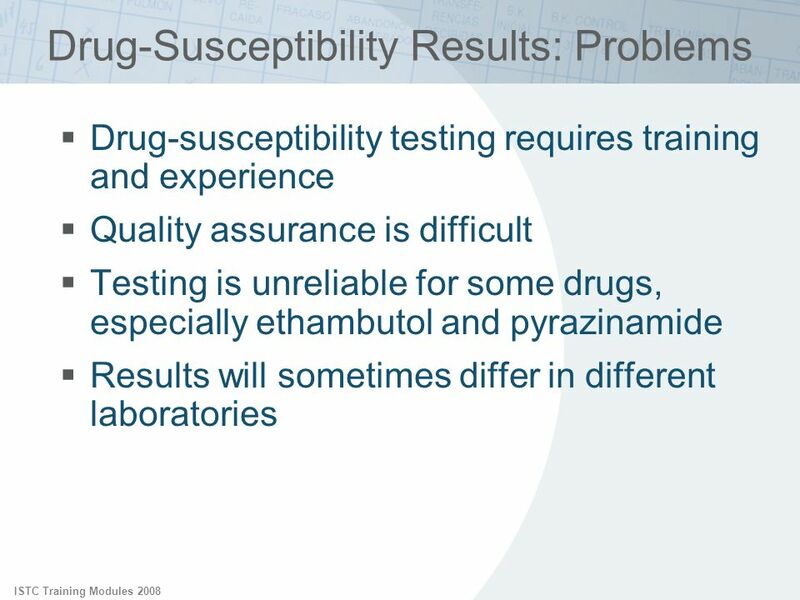 Testing is unreliable for both ethambutol and pyrazinamide. This may lead to conflicting results in different laboratories. 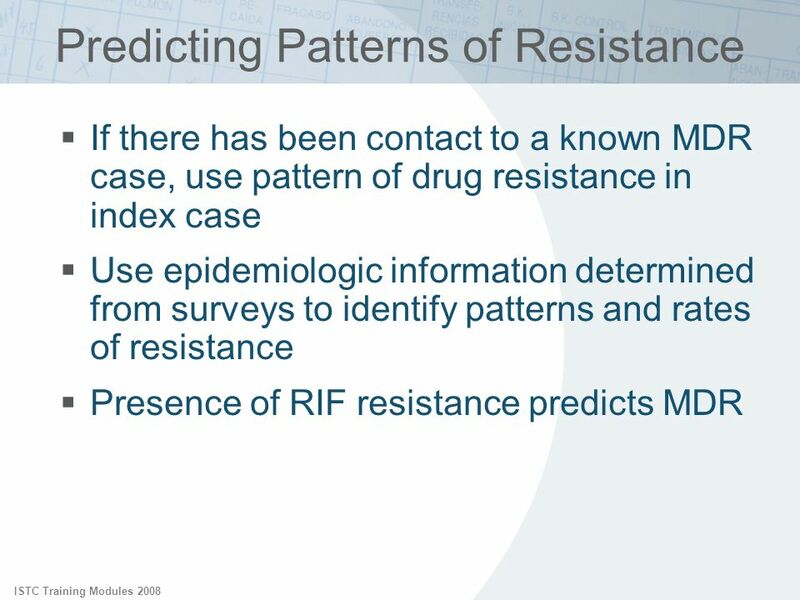 ISTC Training Modules 2008 If there has been contact to a known MDR case, use pattern of drug resistance in index case Use epidemiologic information determined from surveys to identify patterns and rates of resistance Presence of RIF resistance predicts MDR If contact to a known MDR case, use pattern of drug resistance from index case. 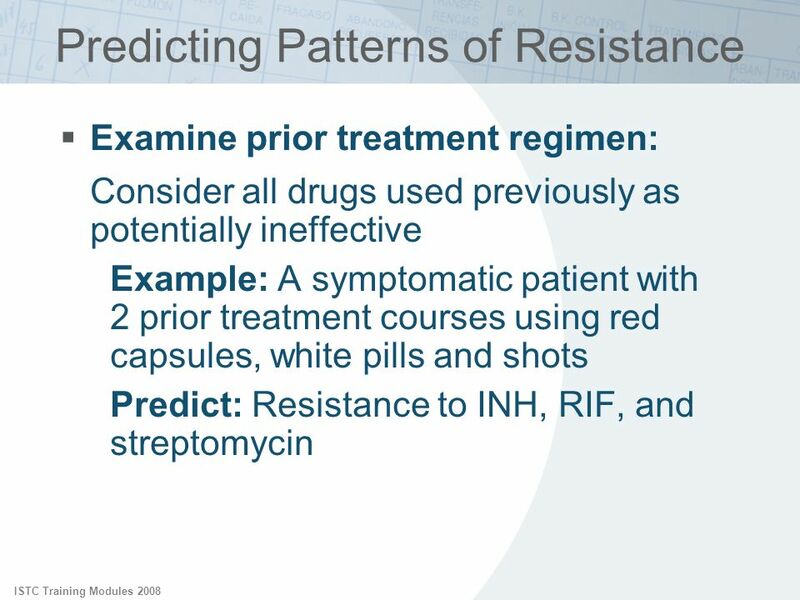 If drug resistance surveys have been performed in the region the results might be used to infer the likelihood and pattern of resistance in an individual patient. 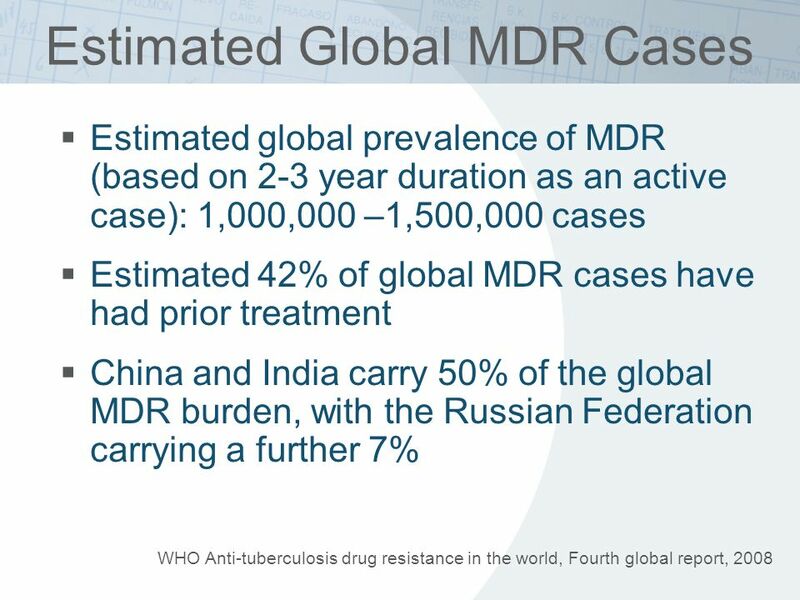 If rifampicin resistance is known, there is a high likelihood that the case is also INH-resistant (MDR). 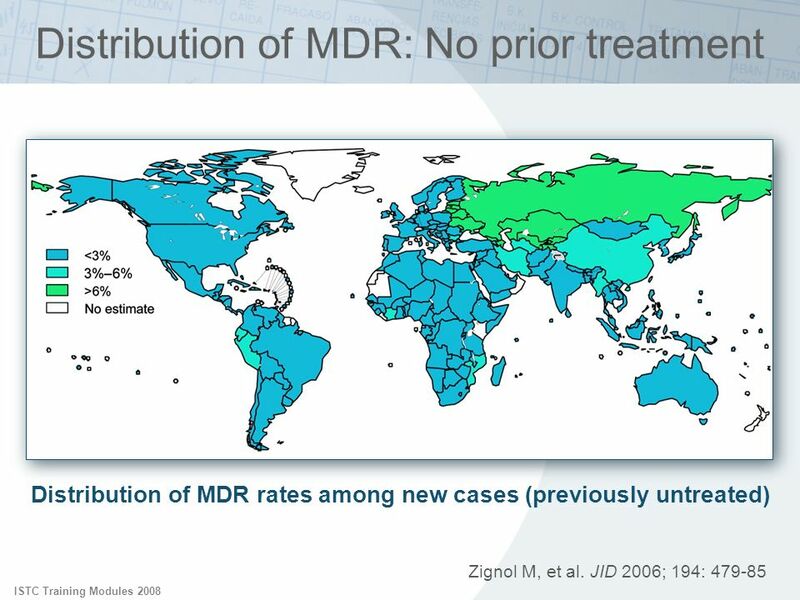 Non-MDR rifampicin resistance is relatively rare (<1% in majority of reporting countries, WHO 2006). 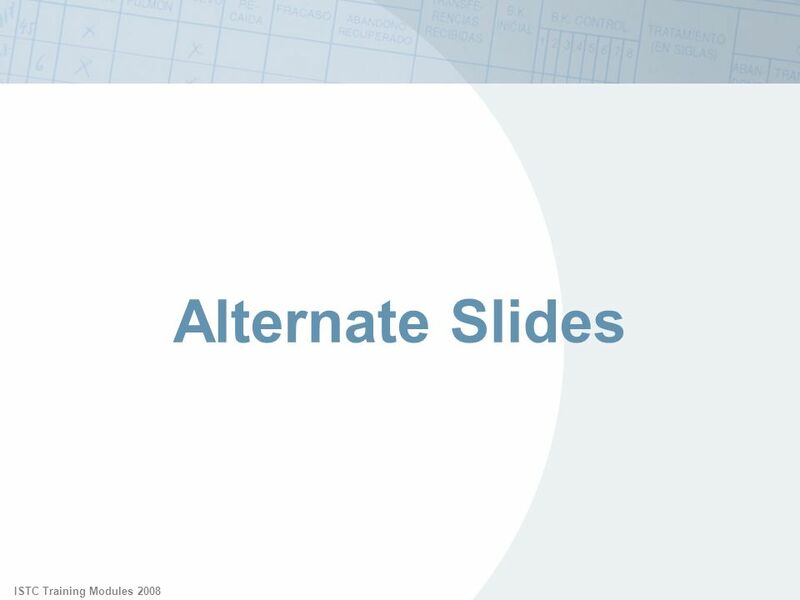 38 ISTC Training Modules 2008 Alternate Slides Alternate Slides: Offer additional options that may be added or substituted into module. See Facilitator’s Guide for further information. 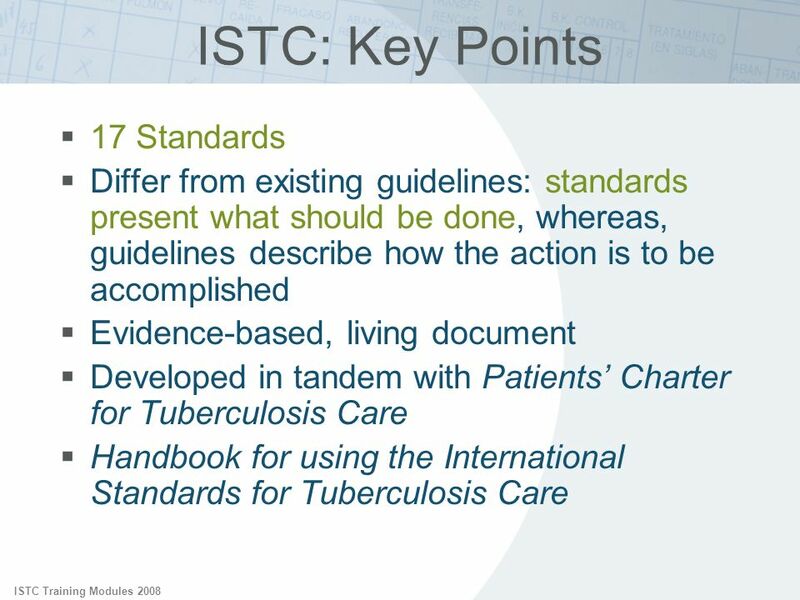 42 ISTC: Key Points ISTC Training Modules 2008 Audience: all health care practitioners, public and private Scope: diagnosis, treatment, and public health responsibilities; intended to complement local and national guidelines Rationale: sound tuberculosis control requires the effective engagement of all providers in providing high quality care and in collaborating with TB control programs The Standards are addressed to all healthcare providers, private and public, who care for persons with proven tuberculosis or with symptoms and signs suggestive of TB. Three categories of activities are addressed by the Standards: diagnosis, treatment, and public health responsibilities of all providers. 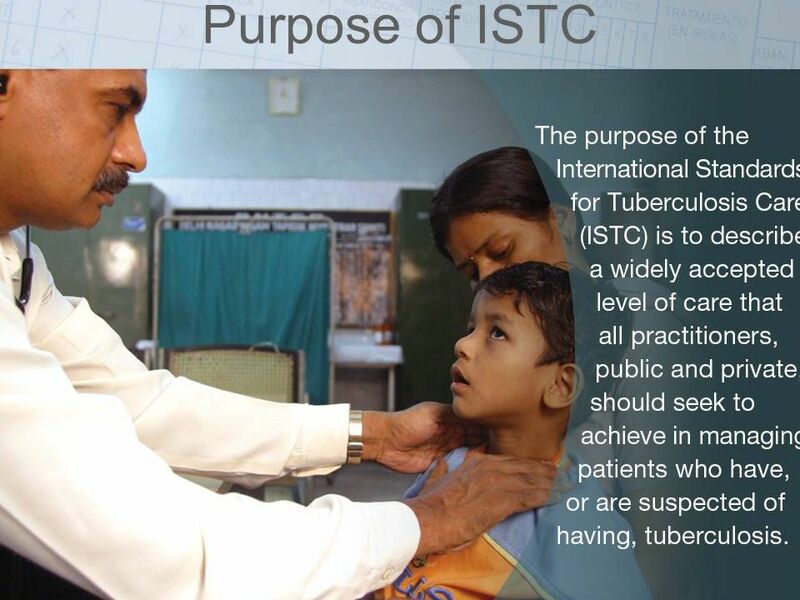 The ISTC are intended to be complementary to local and national TB control policies that are consistent with the World Health Organization (WHO) recommendations. 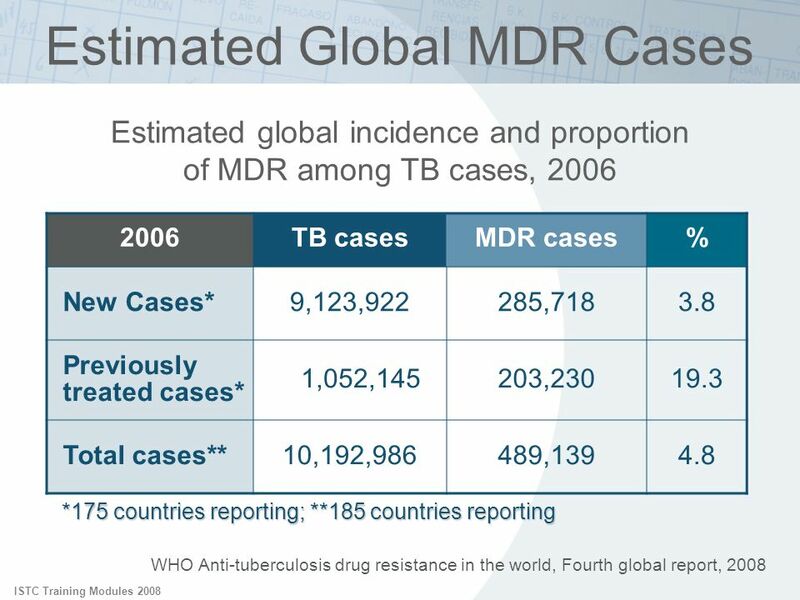 In many parts of the world there is great variability in the quality of tuberculosis care, and poor quality care continues to plague global tuberculosis control efforts. 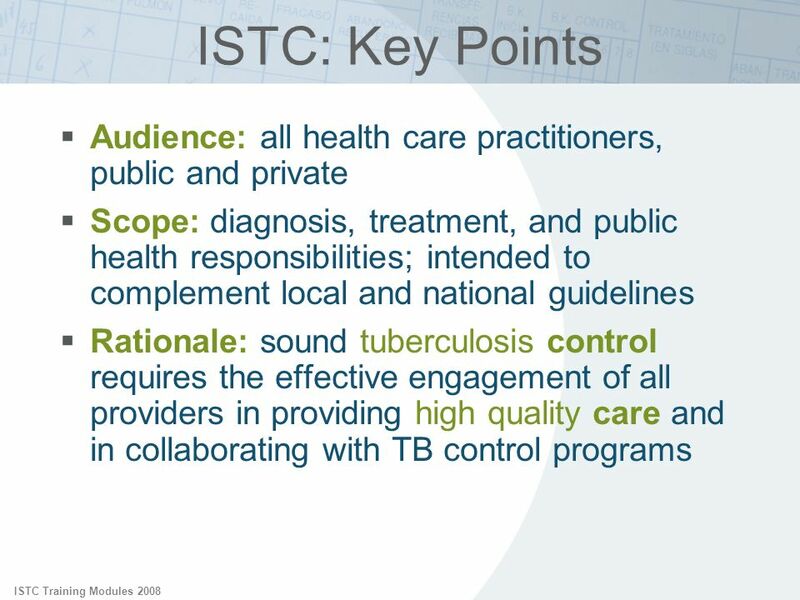 Effective engagement of all providers in providing high quality care in collaboration with TB control programs is key to the promotion of sound tuberculosis control. 43 ISTC Training Modules 2008 Questions Questions: May be used for interactive discussion, course evaluation, or continuing medical education purposes. See Facilitator Guide for further information. 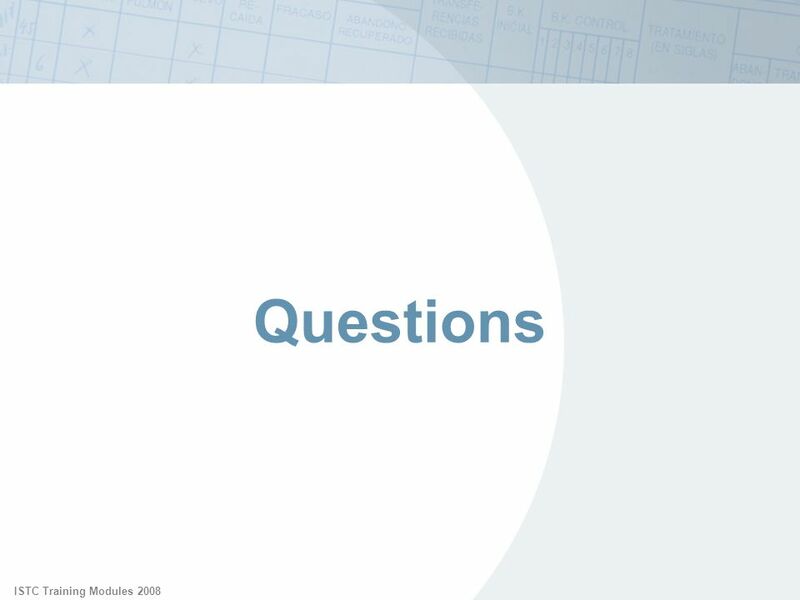 Evaluation Questions Note: If not used for testing purposes, evaluation questions may be used in slide format inserted within or at the end of each module. ISTC Training Modules 2008 Your name Institution/organization Meeting Date. Contact Evaluation Your name Institution/organization Meeting Date International Standard 16. 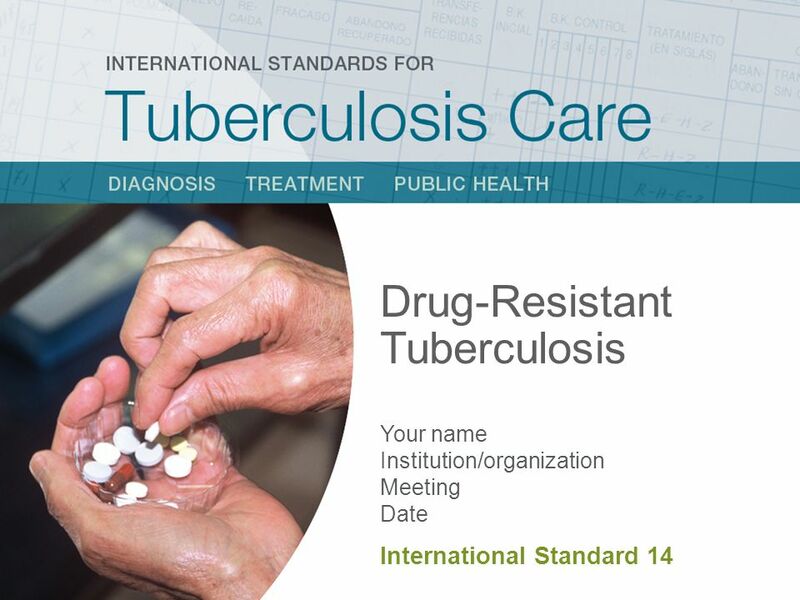 Management of Drug-Resistant Tuberculosis Your name Institution/organization Meeting Date International Standard 12. Contact Evaluation Your name Institution/organization Meeting Date International Standards 18, 19. Your name Institution/organization Meeting Date. Introduction. 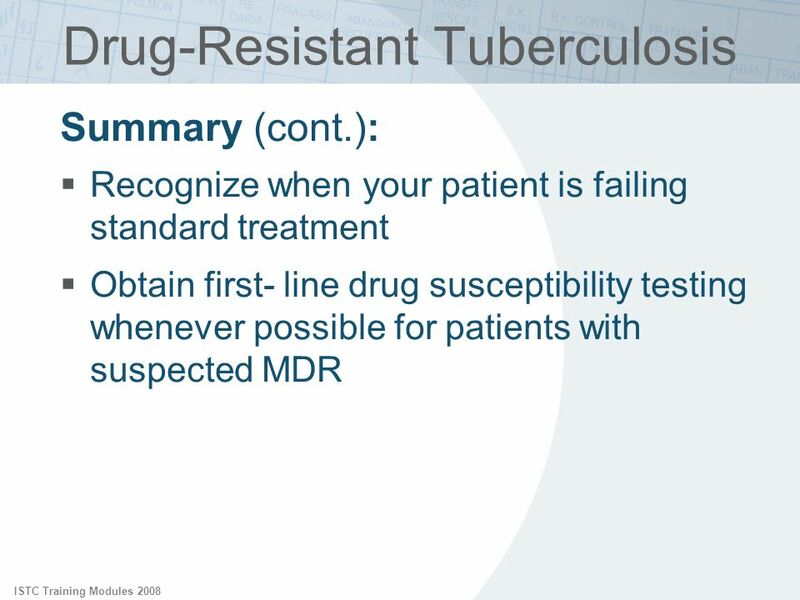 Last Update: April 4, 2004 Division of Tuberculosis Control Virginia Department of Health Richmond, Virginia Tuberculosis Infection & Disease: Fundamentals. 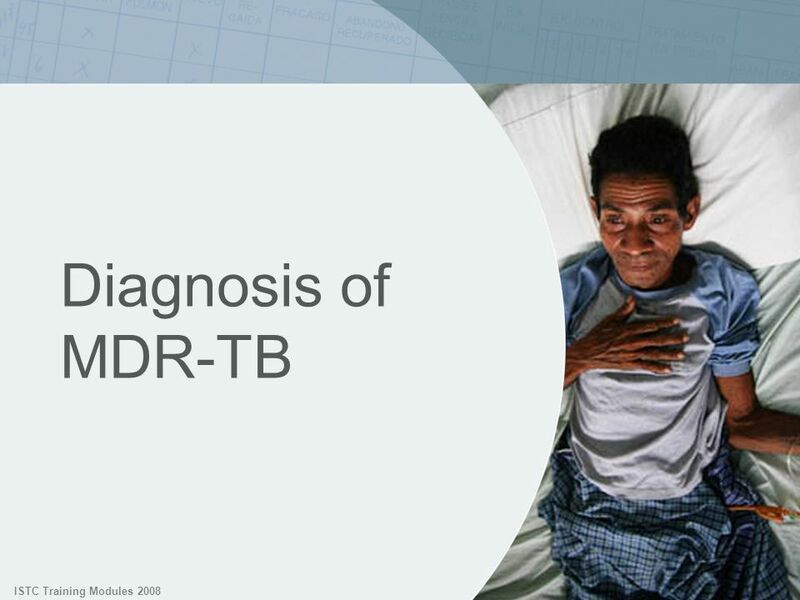 Tuberculosis (TB): clinical diagnosis and management of tuberculosis and measures for its prevention and control March 2006. 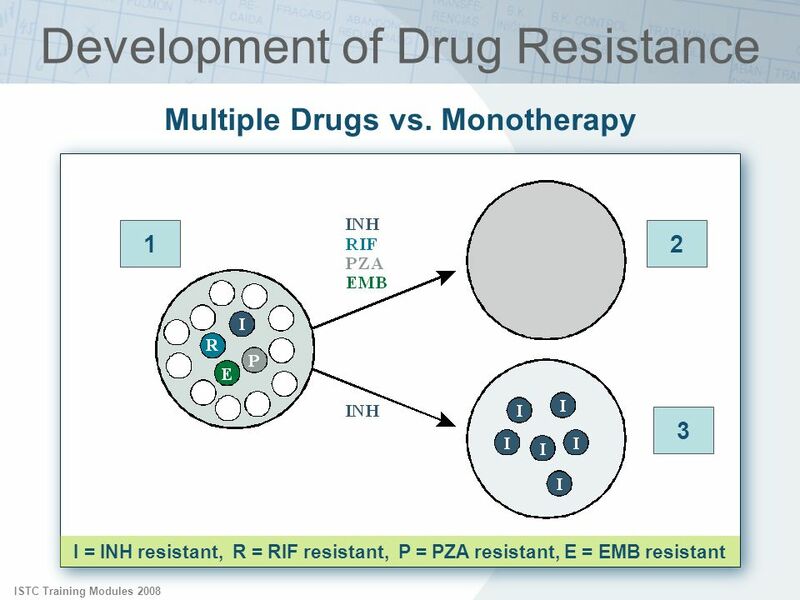 Building Global HIV/AIDS Clinical Pharmacology Research Capacity HIV and TB: Capacity Challenges to the use of Current Drugs and Developing New Drugs Kimberly.